As far as I am concerned, fall is absolutely the most wonderful food time of the year. Cool temperatures combined with an a superabundance of my favourite foods makes me one seriously happy camper; crisp apples so fresh and juicy that you have to eat them leaning over to avoid a soaked shirt are something I look forward to all winter, spring, and summer. When fresh New York apples are spilling out of all of the roadside stands, I eat them accompanying meals, as snacks, and as dessert. 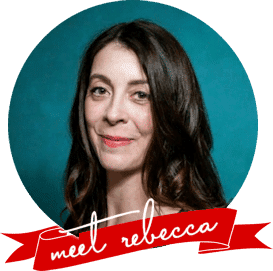 Of all the ways I enjoy them for dessert, though, my go-to is simply sliced with a ramekin of good caramel sauce for dipping. And when the apples are as good as they are right now, the caramel sauce needs to be extraordinary, too. Enter Bourbon Salted Caramel Sauce, stage right. 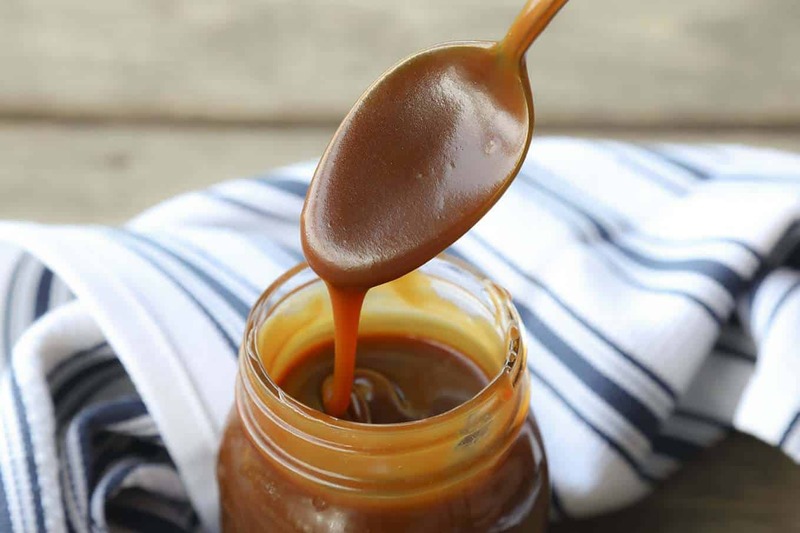 Bourbon Salted Caramel Sauce is what every great caramel should be; just sweet enough, velvety smooth, slightly smoky, and a gorgeous deep amber brown colour. 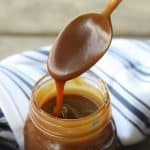 Once you’ve had homemade caramel, no store bought caramel will ever be sufficient for you again. Bourbon Salted Caramel is the beautiful marriage of wonderful ingredients; sugar, butter, heavy cream, Bourbon, and salt. It’s that simple because it doesn’t need to be complicated to be transcendent. Before you do anything else, bring your butter and heavy cream out to warm to room temperature. The butter should be room temperature and cut into tablespoon-ish sized pieces before you start the process of making the Bourbon Salted Caramel Sauce. Once you put that sugar over the heat and start stirring, the next opportunity you have to cut the butter will be when the fully melted caramel is perking along and becoming lovely and again, you don’t walk away from it at that point because it moves pretty fast once you get to that point. It’s best just to have it ready to go. Please use a saucepan with at least 2 quarts of capacity, even though it might seem like overkill size-wise. This is because you’ll have a couple of times that the nearly finished Bourbon Salted Caramel Sauce is going to boil VERY violently and increase in volume. Trust me and my hard won-experience when I tell you that you do NOT want to clean bubbled-over and burnt caramel sauce off of your stove-top. Since molten sugar is far hotter than boiling water you do NOT want to test this with your finger or get it on your skin. If you’ve never caramelized sugar without adding liquid to it, you might be a little worried, but I promise it’s very simple. The only word of caution I have is that you cannot walk away from it. You have to stand there and stir pretty constantly until it moves through a clumpy, damp-sand looking stage and becomes fully melted. As soon as it is fully melted STOP STIRRING! Sorry to shout, but that’s pretty crucial. If you keep stirring at that point, you’ll create crystals which will still be tasty, but will make your finished Bourbon Salted Caramel Sauce gritty instead of velvety smooth. Instead of stirring, you simply swirl the pan from time to time once it reaches this stage. Speaking of things moving quickly, after the sugar is fully melted, it can go from almost but not quite ready to COMPLETELY BURNT in very little time. You really want to watch carefully and look for visual cues from your caramelizing sugar. It will be a deep mahogany or red-brown and very aromatic. If you use an instant read or candy making thermometer, it will register between 340°F and 350°F. This is where you’ll add your butter in one fell swoop. Do this carefully and be cautious, because it will boil and bubble violently. Regarding salt: This recipe is designed to be made with coarse flake sea salt. Do not substitute table salt or kosher salt or real salt as they will yield a caramel that will be unpalatably salty. Regarding bourbon: Use whichever bourbon you like for drinking. The alcohol will boil out, but the flavour remains, so it’s best to start with one you enjoy by itself! Store your leftover Bourbon Salted Caramel in a microwave or heat-safe jar with a tight fitting lid in the refrigerator. When you want to serve it, you can serve it cold and quite thick, or microwave it lid-free for just long enough to be able to gently warm it, stir it, and pour it smoothly. If you prefer not to microwave it, you can set the jar in a pan full of hot tap water for a few minutes to help loosen it up. Bourbon Salted Caramel Sauce is what every great caramel should be; just sweet enough, velvety smooth, slightly smoky, and a gorgeous deep amber brown colour. Sprinkle the sugar evenly over the bottom of a heavy-bottomed saucepan of at least 2 quarts but preferably 3 quarts in capacity. Place the sugar over medium high heat and whisk as it begins to melt and clump. Continue whisking until all of the sugar is melted and then remove the whisk and swirl the pan from time to time until it reaches a deep amber colour or 340°F to 350°F. Add the softened butter carefully and all at once; it will bubble furiously. Whisk until the butter is incorporated and remove from the heat. Whisk in the heavy cream and then the bourbon and salt carefully as it will bubble furiously again. When it stops bubbling, set it aside on a cool burner or a trivet for 10 minutes before transferring to a heat-proof jar. As it cools, it will thicken. Store the Bourbon Salted Caramel Sauce tightly covered in the refrigerator for up to 1 month. To reheat, remove the lid and microwave in 10 second bursts, stirring after each one until the caramel is smooth, pourable, and warm but not hot. 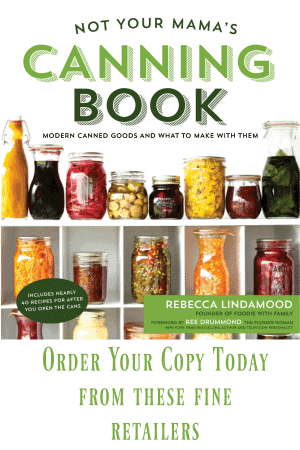 Alternatively, you can place the covered jar in a container of hot tap water for several minutes, or until the caramel is smooth and pourable when stirred. 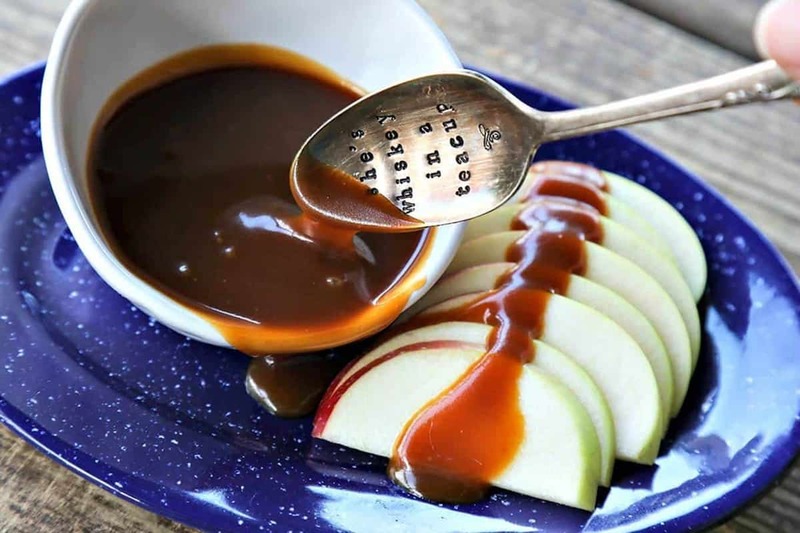 This caramel bourbon sauce looks absolutely amazing. I bet this would make a delicious gelato flavor. The pictures of this sauce look way too good to be true!